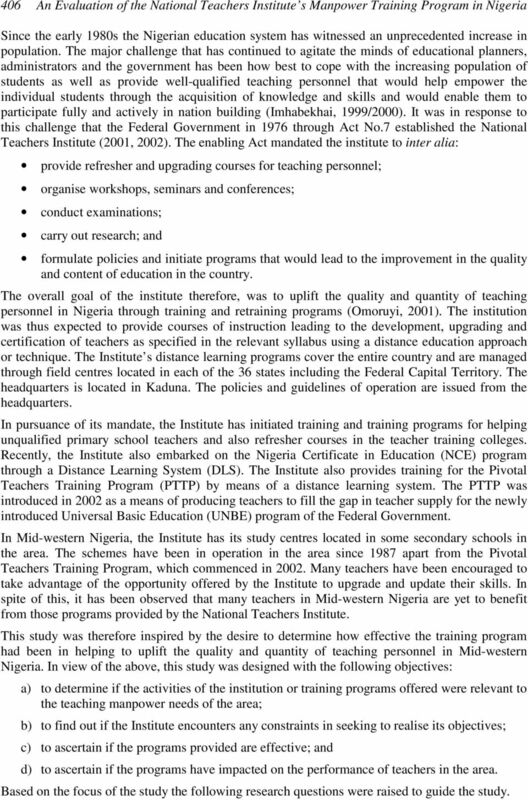 Download "An Evaluation of the National Teachers Institute s Manpower Training Program for Teaching Personnel in Mid-western Nigeria"
1 International Education Journal Vol 5, No 3, An Evaluation of the National Teachers Institute s Manpower Training Program for Teaching Personnel in Mid-western Nigeria A.U. Osunde Faculty Of Education, University of Benin, Nigeria F.E.O. 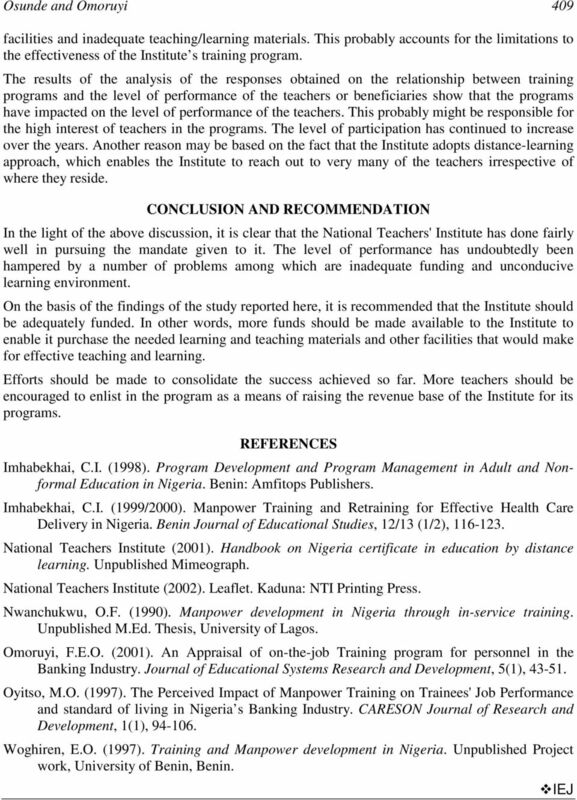 Omoruyi Faculty Of Education, University of Benin, Nigeria This study evaluated the manpower-training program for teaching personnel in Midwestern Nigeria by the National Teachers Institute. Overall 240 participants involved in the training program who were randomly selected from the area constituted the sample for the study. A questionnaire designed by the authors was the major instrument used for data gathering. The analyses of the results obtained showed that the programs are fairly effective in upgrading the skills and knowledge of the participants. It was also discovered that the programs have impacted on the level of performance of the participants in the area. It was recommended inter alia that the institute should be adequately funded to enable it achieve its mandate to the fullest. Since the programs are considered relevant to the training needs of the participants, it would be proper to do everything humanly possible to consolidate the gains of the programs. National Teacher Institute Manpower Training Program, Mid-western Nigeria, questionnaire INTRODUCTION Every educational system in any known human society requires highly skilled teaching personnel to sustain it. This explains why the teachers are regarded as the most important element in the school system. It is generally believed that no educational system can rise above the quality of its teachers. Hence training is often organised for teachers to upgrade and update their knowledge and skills. In Nigeria the need for well qualified teachers has gained pre-eminence because it is considered as a means of not only providing them with the necessary skills and knowledge needed to help educate those who could not gain admission into the regular programs but also those who are unwilling to leave their jobs for full-time education and training programs (Imhabekhai, 1998). Training is conceived as an organised procedure by which people learn and acquire knowledge and skills for a definite purpose (Oyitso, 1997). Nwanchukwu (1990) also sees training as the process of increasing human efficiency through which people are offered the opportunity to acquire new skills and current knowledge required in carrying out various specialised tasks in their place of work. Training and retraining are necessary if efficiency and profits are to be attained. When people are offered training, they acquire new and improved skills and knowledge that will enable them to perform better thereby enhancing their level of productivity. Training and retraining for teachers therefore, is capable of enhancing their level of performance and also enabling them to cope with the ever-increasing challenges of educating the mass of the people in the country (Woghiren, 1997). 2 406 An Evaluation of the National Teachers Institute s Manpower Training Program in Nigeria Since the early 1980s the Nigerian education system has witnessed an unprecedented increase in population. The major challenge that has continued to agitate the minds of educational planners, administrators and the government has been how best to cope with the increasing population of students as well as provide well-qualified teaching personnel that would help empower the individual students through the acquisition of knowledge and skills and would enable them to participate fully and actively in nation building (Imhabekhai, 1999/2000). It was in response to this challenge that the Federal Government in 1976 through Act No.7 established the National Teachers Institute (2001, 2002). The enabling Act mandated the institute to inter alia: provide refresher and upgrading courses for teaching personnel; organise workshops, seminars and conferences; conduct examinations; carry out research; and formulate policies and initiate programs that would lead to the improvement in the quality and content of education in the country. The overall goal of the institute therefore, was to uplift the quality and quantity of teaching personnel in Nigeria through training and retraining programs (Omoruyi, 2001). The institution was thus expected to provide courses of instruction leading to the development, upgrading and certification of teachers as specified in the relevant syllabus using a distance education approach or technique. The Institute s distance learning programs cover the entire country and are managed through field centres located in each of the 36 states including the Federal Capital Territory. The headquarters is located in Kaduna. The policies and guidelines of operation are issued from the headquarters. In pursuance of its mandate, the Institute has initiated training and training programs for helping unqualified primary school teachers and also refresher courses in the teacher training colleges. Recently, the Institute also embarked on the Nigeria Certificate in Education (NCE) program through a Distance Learning System (DLS). The Institute also provides training for the Pivotal Teachers Training Program (PTTP) by means of a distance learning system. The PTTP was introduced in 2002 as a means of producing teachers to fill the gap in teacher supply for the newly introduced Universal Basic Education (UNBE) program of the Federal Government. In Mid-western Nigeria, the Institute has its study centres located in some secondary schools in the area. The schemes have been in operation in the area since 1987 apart from the Pivotal Teachers Training Program, which commenced in Many teachers have been encouraged to take advantage of the opportunity offered by the Institute to upgrade and update their skills. In spite of this, it has been observed that many teachers in Mid-western Nigeria are yet to benefit from those programs provided by the National Teachers Institute. This study was therefore inspired by the desire to determine how effective the training program had been in helping to uplift the quality and quantity of teaching personnel in Mid-western Nigeria. In view of the above, this study was designed with the following objectives: a) to determine if the activities of the institution or training programs offered were relevant to the teaching manpower needs of the area; b) to find out if the Institute encounters any constraints in seeking to realise its objectives; c) to ascertain if the programs provided are effective; and d) to ascertain if the programs have impacted on the performance of teachers in the area. Based on the focus of the study the following research questions were raised to guide the study. 3.1 To investigate the activities of in-service education and training of teachers. Assessment of Counselling Needs Related to Mathematics Performance among Secondary School Students in Maara District, Kenya 76 Monicah Buyatsi Oundo Department of Education (Guidance and Counselling) Dr.
European Journal of Educational Studies 2(2), 2010 ISSN 1946-6331 2010 Ozean Publication AN ANALYSIS OF TEACHERS UTILIZATION IN URBAN AND RURAL SECONDARY SCHOOLS IN MID-WESTERN STATES OF NIGERIA Vincent.O. 2004/10/23 at Capital Normal University, Beijing China Recent Trends on Teacher Education Reform in Japan IWATA, Yasuyuki Associate Professor, Curriculum Center for Teachers, Tokyo Gakugei University 1.